It’s a new year and, it’s going to be a good one. I picked up our local paper the other day and was shocked at the doom and gloom contained within it. For a few moments, I’ll be honest, my stomach lurched as all of the potentially disastrous scenarios played themselves out in my mind, but, with a shake of my head and a folding of the paper I tried to put them out of my head. I won’t bore you with a resolutions list (I don’t have one), but, here’s what I want 2012 to look like for me. I am going to remember and share the kindness and beauty that is still present in everyday life, even if it’s missing from much of our media. I might share videos like this (nature is amazing) or this (seriously I tear every time – it’s ridiculous) or perhaps this (I love this series ‘move’, ‘eat’ and ‘learn’. They make me smile every time). I will remember that for every person who nearly knocked over one of my children while we were out this holiday season, there were five others who were kind and had nothing but smiles to share. These are some of the things I will focus on in 2012. I don’t know what’s in store for this year. I’m going to do things a lot differently with mocobabies – I don’t know what it will all be or how it will turn out, but, that’s the fun of it. It’s going to be a year of trying new things – not just thinking about them. Ups and downs are an inevitable part of life, but the doom and gloom doesn’t have to be. I’m going to do better, try harder and live happier – it’s going to be a good year. 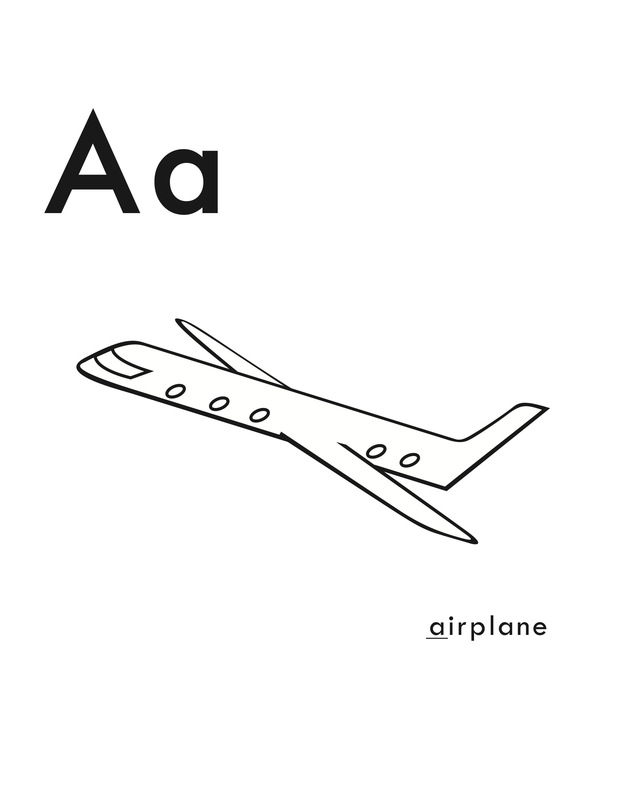 To start it off, here is a colouring page for the letter A that I will post on Facebook and twitter – print it, colour it and have fun making the airplane sign and noises! Do you make resolutions? Do you revisit the list at the end of the year? Lily has been dropping a lot of signs lately but one that she is still working really hard on is ‘I love you’. She will throw her hand up in the air and with an expression of pure confusion look at her hand as if in total disbelief that her fingers aren’t in the position she’s urging them to go. With the utmost concentration she tries to will her fingers into formation but quickly resorts to using her other hand to push her pinky up while keeping those pesky middle fingers down. Tonight, after just a brief moment of concentration, she gave up. She looked from her hand to me and made the next best sign. With a big smile she flashed me the best thumbs up I’ve ever seen. There has been a flutter of activity in our house lately. Literally. We’ve got birds. They make their way in and (usually when my husband isn’t home) we hear the familiar (yet always startling) flutter of wings frantically trying to fly their way through a window. Lily used to love birds. Now when she hears a bird chirping she looks up with pleading eyes and says ‘no bird house’. Often before she lulls off to sleep she’ll open her eyes one last time and say ‘no’ while signing ‘bird’ as one last reassurance that she can drift into dreamland worry-free. When her bird anxiety hits Lily leans in and emphatically says ‘no bird house’. To try and lighten the mood I have started following up with ‘but are there elephants in the basement?’ ‘I think I hear a cow watching TV!’ Lily smiles and in her exaggerated manner say ‘nooooo’ while keeping a keen eye on me to determine whether I’m just incredibly silly or she should be fleeing. Her playfulness is such a great indicator of how far she has come since we began her speech therapy. It has also made me realize, as her often-muddled words come a mile a minute, how important context has become. The other day she said something with a look of both mischief and fear. I picked her up and the guessing game began. I finally asked if there was a sign that she had that would help mommy understand. She replied ‘yes’ with a smile and her trademark twinkle. No sign followed. I continued guessing and finally on my third sign request she signed ‘cow’. I laughed and said ‘No, Lily there’s no cow in the house!’ and with a giggle she followed up with ‘no bird house’. Lily almost always signs bird as she says it. Although I will be proud, I will also be incredibly sad when the day comes that she says it without signing it as well. Like the disappearance of little toddler feet, it will be a small sign that my baby girl is growing up. I ran into incredibly lovely people this morning – and I mean that in the most sarcastic way possible. There are many things that irritate me but perhaps none more than rudeness, particularly when the individual is modelling the behaviour in front of their children. People nowadays are in such a rush, overwhelmed and busy that common courtesy often seems to be a thing of the past. A woman this morning treated us, probably unknowingly, like we were completely invisible. In my oh-so-Canadian way I found myself moving Jack out of her path as she nearly knocked him over and uttering ‘Oh, sorry!’. I kicked myself for my auto-apology because she didn’t acknowledge what she’d done nor that we even existed. Moments later I held the door open for her and she brushed by us without even glancing in our direction let alone saying thank you. A little while later, when picking up some milk before heading to work, I was walking out of an isle as another mom, with baby in cart, was turning to get in. I again said ‘sorry’ and moved aside letting her go by. I stood there with the most ridiculous smile plastered on my face as I waited for her to acknowledge me with something other than a scowl as she very deliberately looked me up and down with utter disdain. I am far from perfect and my children often times forget their manners. I try to use situations like this morning to teach Jack and Lily how important it is to remember your please and thank you’s; that we are no more or less important than anyone else and that the smallest actions, or lack thereof, can have an impact on another person. This morning after run-in number 1 I asked Jack what he would have done differently and he, much to my pleasure, replied “I would have said thank you! She was very very rude mom’. It’s sad the enormous pride I felt in that moment – it’s the little things that make me happy. So it is here that I have posted the signs for please and thank you! Jack and Lily loved singing ‘please’ and through sign my kids have been using their manners since about 12 months old. ‘Please’ was their favourite, most likely because they quickly saw that we all thought it was adorable and would usually give them whatever they were asking for. A byproduct of signing with baby that I have loved is that it provides a mechanism for sending silent messages across a room to your children (as well as your significant other!). There have been many times when I have looked at Jackson or Lily and subtly made the ‘thank you’ or ‘please’ sign as a reminder that they need to use their manners. There have been times as well when I have seen them doing something special or something that I’ve asked and have signed ‘thank you’ from a distance. They usually light up knowing their good behaviour has been acknowledged. This morning was one of those mornings that had me completely preoccupied wondering what kind of world my kids are growing up in. Fortunately, as I flipped on the television for background noise I heard “Boom De Ya Da”. I stopped, watched and remembered, as The Discovery Channel commercial exclaims, that “The World Is Just Awesome”. I remembered to never judge because you never know what is happening in another person’s life. And I remembered to be thankful for my self control that I didn’t push the door closed on her foot or use my rather extensive foul vocabulary in front of my children. Click on the following links and you can download the signs for Please and Thank You! You can print them out and put them up, much like our Little Helper stickers, as a reminder of the signs! On March 28th, Tim Allen and his wife welcomed to the world their beautiful daughter Elizabeth Allen. Maxine Bahns (The Mentalist) welcomed daughter Madison Rose on March 8th. I love any and all news about babies and I’m excited to think that just maybe both families will try their mocobabies flash cards and share in the awe-inspiring signing moments that we have enjoyed with our children.